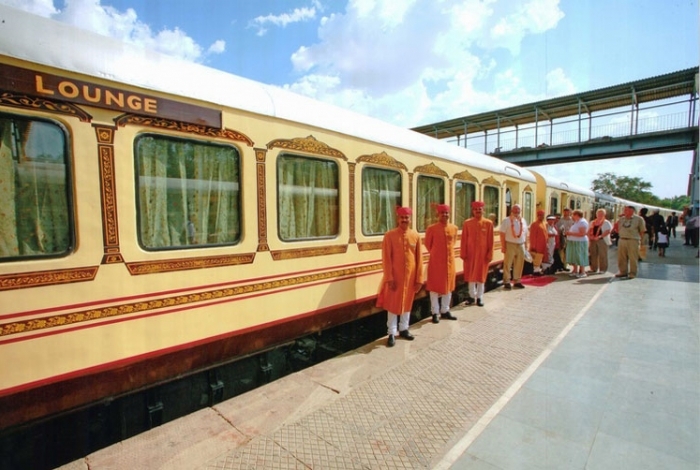 Palace on Wheels is one of the dignified luxury trains in India. The train caters luxury train journeys to those who want a five star hotel level of service throughout their trip. Here are the top elements of your travel that would make you feel like on the king of all journeys. The journey starts from Delhi station and from that moment on, you would be allocated with a butler who would cater all your needs. It is time to be pampered throughout the week. The train moves slowly to make sure that you have adequate time and balance to walk around the train and enjoy its services. You can dine like a king in two different restaurants and also relax back with a glass of drink in the lounge room. The cabins in the luxury train of India are decorated and maintained in such a manner that it would suit the kings of the world. Once outside the train, you would again be pampered with special vehicles, welcome kit inside the vehicles and others. You need not worry about any aspect of the journey as everything would be planned and executed by the manager; on behalf of you. Starting from hot water to laundry service, you can enjoy the comfort of home and the attractions of a tropical vacation spot. Every day the train enters a different location and it would a difference experience in terms of meal specials, sceneries and tourist attractions. If you are a nature lover, you would enjoy the safari at Ranthambore national park. Some special cultural performances would be conducted specially for you. Thus, you can enjoy the culture of the land within leaving the premises of your comfort. It is a week-long trip that would take you to various different destinations and this makes things very interesting for all age groups. None of your family member would feel bored. Celebrate anyone’s birthday inside the train and enjoy cake and other specials. This would be the most enjoyable birthdays of all. Skip an excursion and have the train to yourself for a few hours. You need to talk to the train manager about this. It would be interesting to watch the train being filled with water and also enjoy the amenities inside the train. If you are looking to enhance your vacation experience with Palace on Wheels train, book your tickets today. The tickets tend to get booked months before the departure date. Thus, make sure to book at least three months in advance. Visit the official site of Palace on Wheels or talk to your travel agent today.